You may have noticed that the term “leadership” seems to be just about every- where you look lately. If you haven’t, take a closer look around. Our bookstore shelves include popular books on the subject (e.g., Northouse, 2007). A simple Google search of the term yields an astounding 784,000,000 results! And the interest in leadership extends far beyond popular culture. Increasingly, colleges and universities identify the development of leaders as central to their missions. Over the past ten years many institutions of higher education have begun in- vesting resources into the creation of leadership centers which sponsor a variety of leadership activities and programs, and more recently, universities have begun to establish academic programs dedicated to leadership studies (Bennis & Goldsmith, 1997; Dugan, 2006). So, what is driving this intensive interest in leadership? One driving factor may be that leadership skills are a highly valued commodity in the workplace. Did you know that employers consistently identify leadership skills as among the top qualities they are seeking in new employees? Every year corporations invest millions of dollars in leadership training and development for their workers (Nelson & Quick, 2009). Another and perhaps even more significant factor may be what some have called a “global crisis of leadership” that is resulting in the deterioration of our corporations, political systems, and communities (Burns, 1978; Gardner, 1990; Bennis & Goldsmith, 1997). Scholars have suggested that this pervasive failure of leadership not only impedes our ability to address many of the urgent problems which threaten our society, but also contributes to an increasing skepticism of leaders in general (Komives, Lucas, & McMahon, 1998). It follows then, that if we hope to improve our world, we must give careful consideration to the ways in which we conceptualize and practice leadership. Do you believe that we are experiencing a crisis of leadership in this country? If so, what evidence supports that belief? If not, what is your perception of our current leaders? What do you think it takes to develop strong and ethical leaders? Leadership development occurs in various arenas throughout the collegiate environment, but a good deal of what is known about college student leadership development has emerged from the work of scholars and practitioners in various fields related to Student Affairs, College Student Personnel, and Educational Leadership. Dugan (2006) states that the “research has demonstrated that college students can and do increase their leadership skills while in college” (p. 335). And this growth is attributable, in part, to their involvement outside of the classroom, in various types of student organizations and activities. Astin (1993) found a significant correlation between student involvement and leadership development. Studies also show that involvement in leadership activities enhances students’ sense of themselves as citizens of a broad societal community (Dugan, 2006). More specifically, the work of Komives, Owen, Longerbeam, Mainella, and Osteen (2005) suggests that it is through organizational involvement that college students 1) learn about themselves in relation to others; 2) practice various leadership skills; 3) examine and reflect on their leadership experiences; and 4) deepen their understanding of leadership and their own leadership identity. 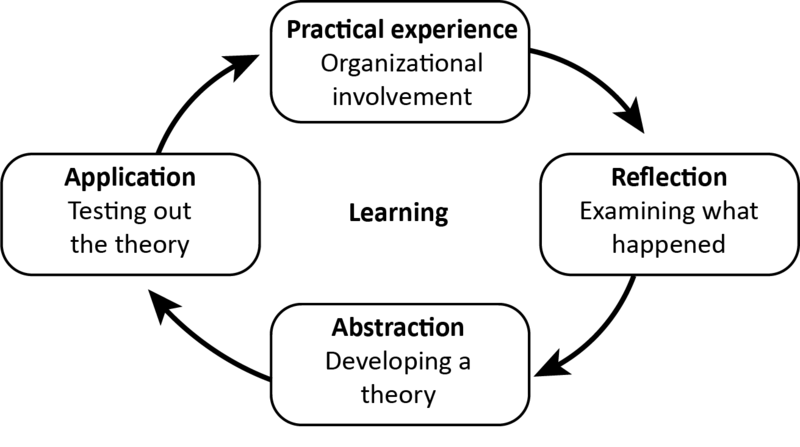 This is consistent with Kolb’s Cycle of Experiential Learning (see Figure 3-3) which emphasizes the importance of experience in the learning process. When you think back over your life, which experience/activities have aided you most in the development of your leadership skills? What made them particularly beneficial for you? Are you currently involved or planning to be involved at UT Arlington? What kinds of activities do you want to get involved in while in college? What attracts you to these? You can engage in the practice of leadership as a small group leader or a presenter of a breakout session at a retreat. You might also choose to be a MavsACT Leader or graduate with leadership honors through the Leadership Academy. There are so many options for you to choose from. The Center’s approach to leadership development is explicitly guided by two leadership development models (Relational Leadership and Social Change) which reflect what Rost (1993) has termed the post-industrial paradigm of leadership. According to this approach, leadership is a process which involves the development of collaborative relationships, the use of non-coercive influence, the achievement of shared purpose and vision, and a focus on making transformational changes in the service of organizations, communities, and society. This view of leadership represents a significant departure from what Rost calls the pre-industrial paradigm of leadership which focused heavily on the traits, attitudes, and behaviors of “the leader” and viewed the people in management positions as the primary “doers” of leadership in an organization. The post- industrial paradigm suggests that leadership is, instead, a dynamic process that is influenced by all of the participants involved in it. From this perspective, leadership can and should emerge from anyone and everyone in the organization regardless of title and position. The “leader” is no longer viewed as the authority but rather as a facilitator of the change process or the achievement of shared goals. Many scholars view this paradigm shift as critical to our ability to manage complex organizations and address the multifaceted issues confronting us in this new millennium. What do you think? While the Center’s work is explicitly guided by a particular view of leadership, there are many other leadership development opportunities within the Division of Student Affairs that operate from slightly different perspectives. Each of these programs possesses unique characteristics and foci. But all of the leadership programs in Student Affairs are knitted together by an emphasis on some or all of five Core Leadership Competencies, which are identified in the table below. You will also see some examples of the programs the Division offers that will help you develop these particular skills. As you can see, the opportunities for you to realize your leadership potential are plentiful. 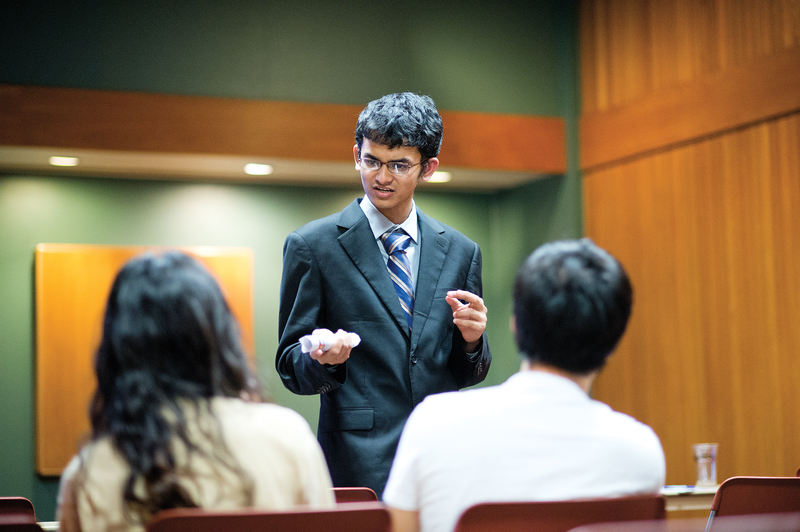 Leadership is indeed happening all around you here at UT Arlington. We invite you to find your place and participate. How do you define leadership? Are your views more aligned with the industrial or post-industrial views as defined by Rost? What kinds of leadership experiences will help you get to the next level of your leadership development?